ice cream flavors in your coffee mug! What do you get when you combine some of the best coffee and ice cream flavors together? An incredible cup of coffee! The coffee in this variety box is smooth and rich in taste. Each one has the perfect amount of flavor to create the most delicious cup of coffee. I took some of these with me to my Mom's for Thanksgiving for everyone to try. Everyone had their favorite one. Or in the case of my Uncle - two flavors. He couldn't decide which one he like the most. There is such a great variety of coffee in this box that there is something for everyone to love. on the Twas the Hop Before Christmas Giveaway Hop! 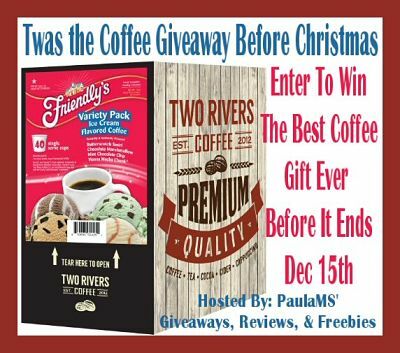 Prize: One lucky reader will win a 40 count box of Friendly’s Coffee just in time for the holidays! Disclaimer: PaulaMS’ Giveaways, Reviews, and Freebies is sponsoring this giveaway and is responsible for the awarding of the prize. Any Questions about this giveaway? Email Paula At paula_stewart (at) ymail (dot) com. Many bloggers have teamed up to bring you the last The Hopping Bloggers Giveaway Hop of the year! And we saved the best for last – just check out these prizes! Be sure to enter them all – there is no limit to how many you can win. Previous post: Sugar Bowl Bakery has National Cookie and National Brownie Day Covered! I love variety packs so I can try different flavors. Thanks for the chance. We love coffee in our family I would love to win this for them!